Zagreb (Croatia) – Best Western Astoria (£78 for a twin room) – check-in was seamless. For the price we’d paid the place was a steal; it was spotless, the room very well kept, the staff friendly and the breakfast the following morning turned out to be cracking with a massive choice, including some hot stuff! I was up and about at Villach, while not really needing to be it I would have been rude not to check out if there was going to be any gronk action. Of course there wasn’t with 1116146 shunting the portion for Italy straight off the front and then SZ 541013 shunting an additional coach onto the front of the train before working it forward to Dobova. Back to sleep it was then….. I was awake at Ljubljana, thanks to the noise being created by some brat in a compartment further up the coach. While scanning outside the window I noted the following: 363005 arrive with a train and terminate 342001, 014, 023 & 005, with 541003 & 004, all lined up by the station and 644016/012 & 664111 stabled in the sidings. I didn’t sleep a great deal more from Ljubljana and spent some time admiring the scenery as we glided our way towards the Slovenian border. 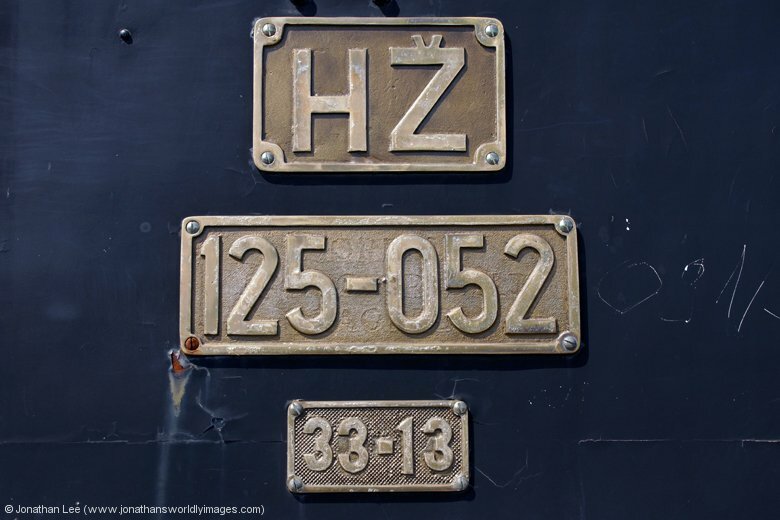 At which there was a passport check by Croatian officials; while SZ 541013 was being replaced by HZ 1142013. In the station waiting to depart was ZS 342025 with EC158 0722 Zagreb – Wien Meidling. Passport grip over we were away from Dobova only 10 late and into Zagreb only a few minutes late. Thankfully the sleeper coach attendant had brought my Inter Rail and reservation back when he produced a complimentary coffee after Dobova, so all was well. 1142013, in its nice yellow livery, made for a nice photo upon arrival as the morning sun beamed down on it. It looked set to be a decent day weather wise; I was only hoping that the trains would hold up their end of the bargain. 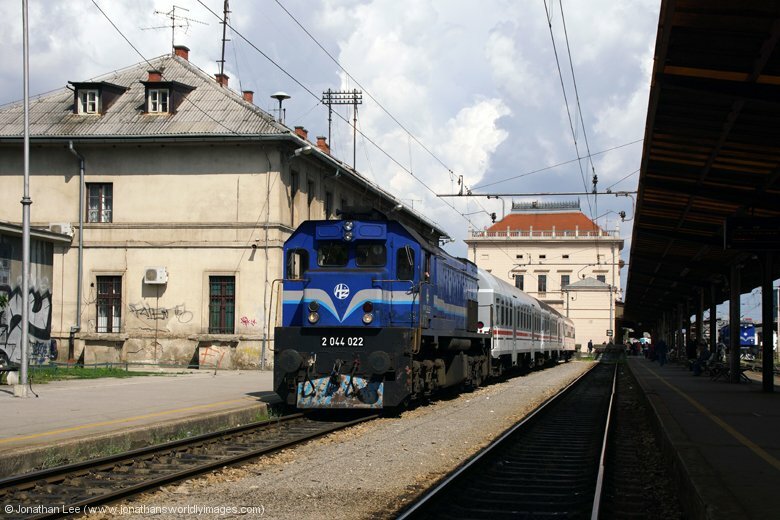 1141302 was sat in the adjacent platform to that in which my overnight had arrived with 397 0918 Zagreb – Sarajevo. What I hadn’t released at the time was that some of the coaches off my overnight were shunted off and onto the rear of IC201 1002 Zargreb – Budapest; the labels in the coaches being a bit of a giveaway that this might happen. I spotted this 48 hours later just as a gronk was backing said stock onto IC201, that we were about to do forward from Zagreb! Doh! The first thing I noticed about Zagreb Glavni Kolodvor was that the platform numbering seemed a bit random. The arrival/departure screens had two columns, one that gave a platform and the second that gave a place on the platform. 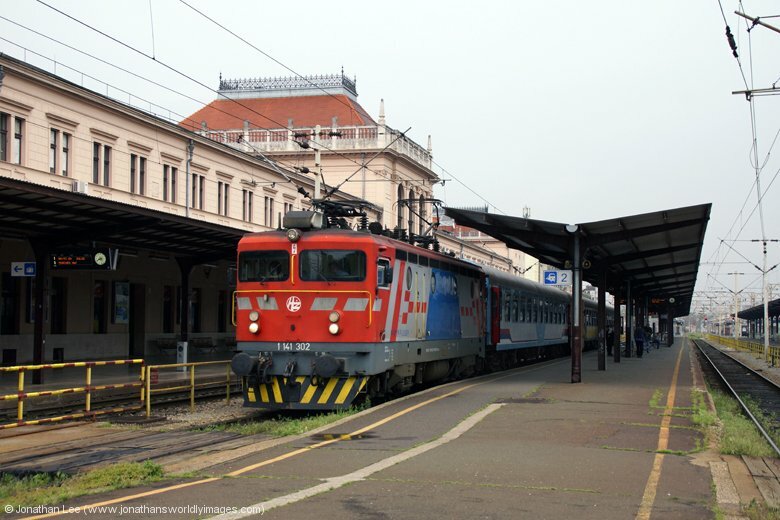 This was ok, in a fashion, for the through platforms but I was having a hard time figuring out where the 0930 Zagreb – Varazdin should depart from. I eventually found it in platform 4, place 2; in a bay platform. There are 4 bay platforms at the end of the station, all of which are platform 4 with each then having the secondary number to represent it. I was struggling to understand at that point why each platform hadn’t either been numbered separately or given a letter prefix; the later would have been perfectly acceptable. I found later that some did actually have letter prefixes after their secondary number; farce! I will say though that once I’d got used to it finding the platforms was straight forward enough. 2044024 headed the 0930 Zagreb – Varazdin and departed bang on time, depositing me round the corner at Zagreb Zapadni Kolodvor 5 minutes later; where 2044016 could be seen approaching in the distance before ‘024 had even departed. Neither were really given any thrash on the short journeys I did on them so I couldn’t comment on whether they were any good or not at that point. As I’d not quite got used to the platform numbering scenario I’d spent some time studying the departure posters on the platforms before I’d left on 2044024; this at least then had me prepared to make the cross platform leap from 2044016 to 1141307 as the 0539 Kotoriba – Zagreb arrived back into platform 4 bays again. 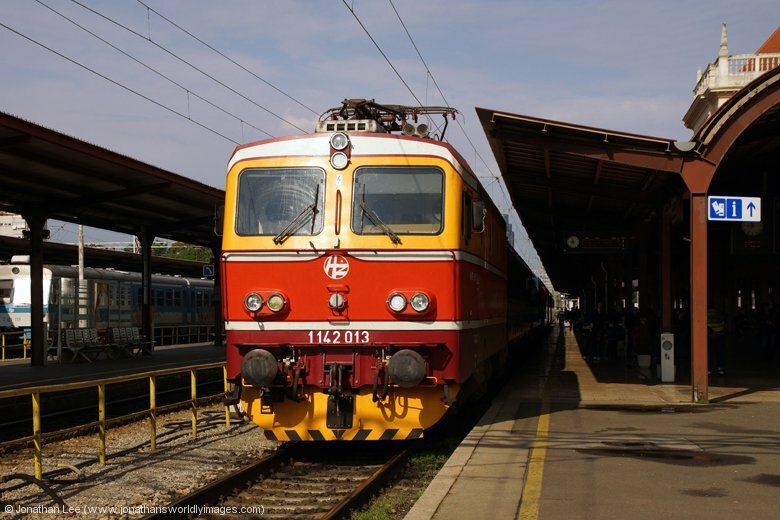 1141307 was working 4052 0950 Zagreb – Ogulin. I’d seen it work in just after I’d arrived on my overnight and it had been shunt released by a gronk to allow it to work straight back. The train wasn’t wedged and was spot on time as it trundled out of town. Little did I realise that Mavracici would be in the middle of nowhere, with a single line platform and about three buildings anywhere near it. 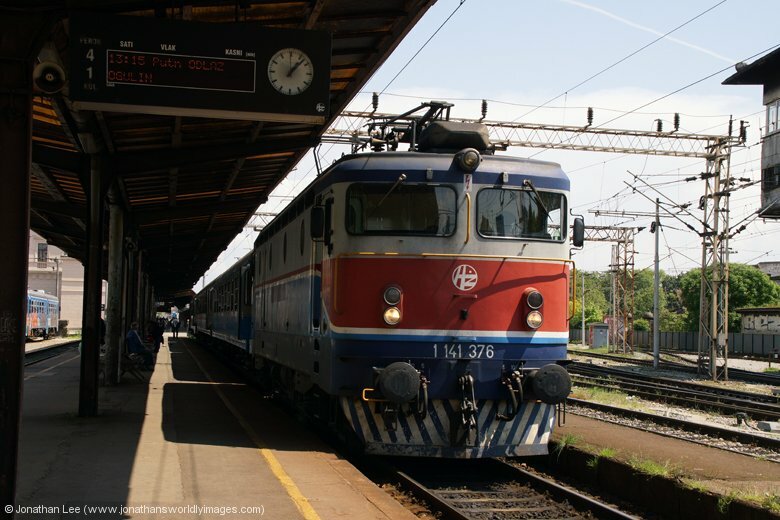 Still, off I got and waited it out and 1141380 soon arrived with 4057 0800 Moravice – Zagreb. 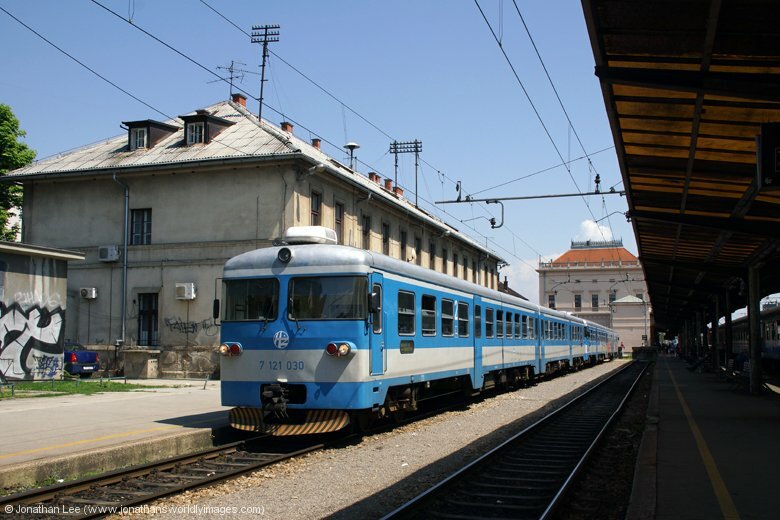 My next move was out to Dugo Selo, where I would have originally had a choice of two trains out for two trains back but just like my overnight, EN415 Zurich – Beograd was being diverted in Austria. This though hadn’t been retimed and was running approx. 4 hours late from Austria to Beograd; leaving me with only one option for a move to Dugo Selo, or so I thought. Sat in platform 2 was a load three IC set and the screens had EN415 on them. 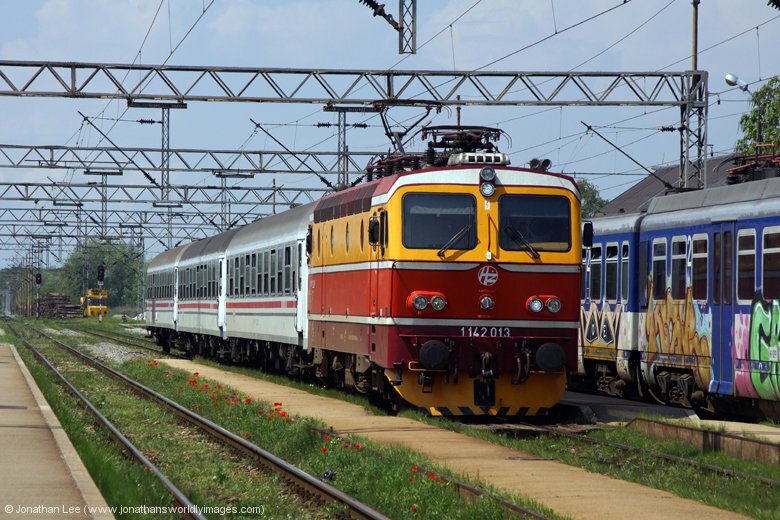 Investigation revealed that the set was forming EN415 1115 Zagreb – Vinkovci only; basically running in the booked path within Croatia only. The disappointment on people’s faces when they were told that they had to wait over 4 hours for their train to Beograd was immediately evident. I wasn’t disappointed as I boarded whatever train it was running as, with 1142005 at its helm, as this meant I’d still have a choice of two trains back from Dugo Selo; not that it mattered to me as I needed everything anyway but it did give an option if one was late of course. It was scorching as I stood on the platform at Dugo Selo, so much so that I had to hide in the shade with everyone else. 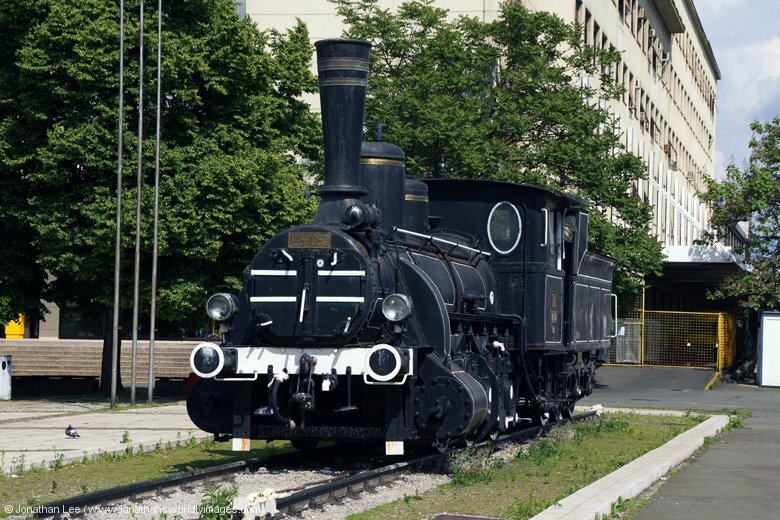 The engineering works that have been buggering up services at weekends on the Zagreb – Dugo Selo line, were clearly visible. Part of the section had been completely relayed and there were debris from the old tracks (sleepers/rails etc) all along the route. Thankfully said engineering work wasn’t taking place the following day and we’d get away with a day’s bash unscathed; unlike the previous weekend where 2044001/2062xxx had been dragging trains over part of the section making a right mess of the timetable! 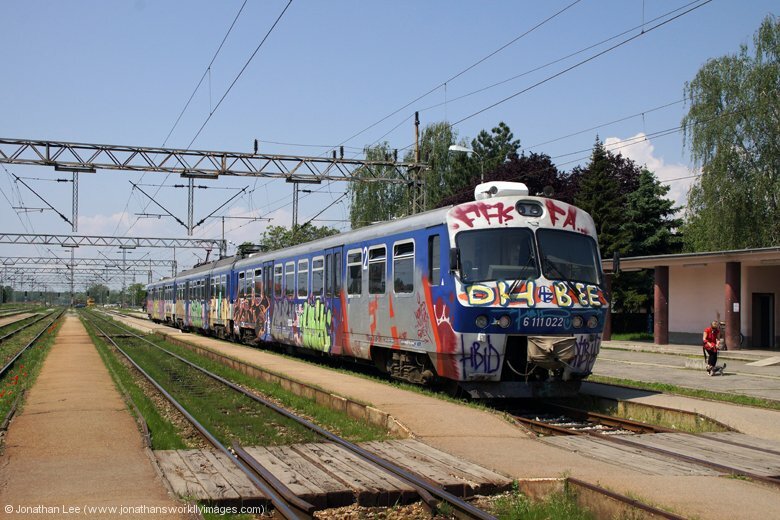 I thought Italy was bad for graffiti until EMU 6111022 rolled in with the 1131 Zagreb – Dugo Selo stopper; it was covered from top to bottom and end to end in graffiti, even on the front and rear ends! It did only seem to be the EMU’s that took the beating with regards graffiti as the locos and stock seemed fine. 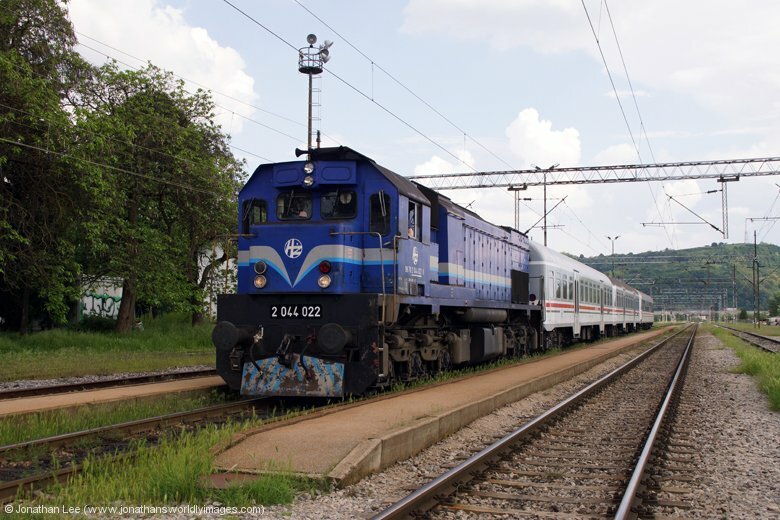 1142001 was the first loco to roll in heading back to Zagreb, with EC210 0901 Vinkovci – Villach HB, and on board I got. Back in Zagreb I had a bit of time to kill so wondered round outside the station to get a few photos of the very well looked after buildings around the station area. It’s very open outside Zagreb Glavni Kolodvor and even the station building itself is well worth a photo. Old trams run by, right outside the station entrance, to take people into town and the atmosphere outside was just like one that would have you believe it was the middle of summer. People were sat around in the park, on the grass, in front of the picturesque Art Pavilion while others were taking shelter from the sun by the large King Tomislav statue that is directly between the station and Art Pavilion; also well worth a photo. While sat minding my own business, moments from departure with 1141376 on 4054 1315 Zagreb – Ogulin, into the compartment came a very out of breath and sweaty Aidy. 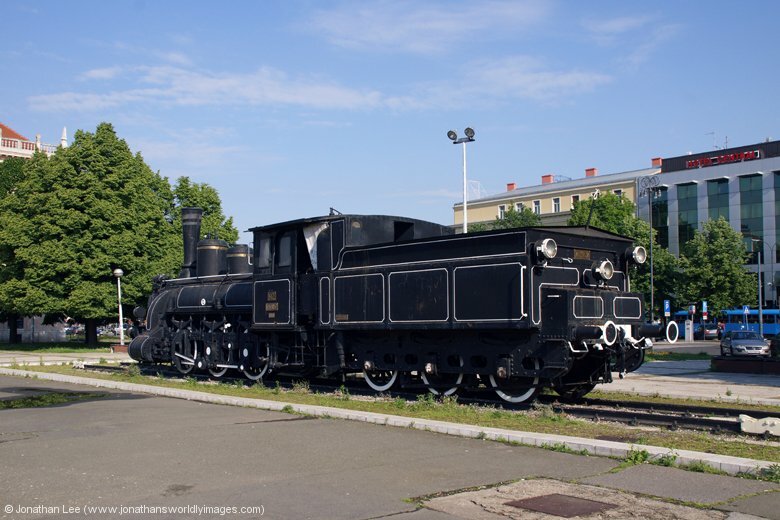 He’d landed into Zagreb and missed the bus that would have given him a comfortable walk from the bus station to railway station in Zagreb; thus had been forced to get a bit of a shift on, in the hot weather, to make the 1315 Ogulin; taking him until we got off at Desinec to almost recover! Desinec, like Mavracici that I’d got off at in the morning, was nothing but a platform surrounded by open land. Despite its countryside feel the tranquility it offered was quite relaxing while we waited for what turned out to be 1141304 to return us to Zagreb on 4061 1200 Ogulin – Zagreb. We used the 45 minute break we had to nip to the Best Western Hotel we’d pre-booked and check in. It was only a 5 minute walk from the station front and check-in was seamless. For the price we’d paid the place was a steal; it was spotless, the room very well kept, the staff friendly and the breakfast the following morning turned out to be cracking with a massive choice, including some hot stuff! After another stroll around outside the station and a bite to eat from one of the bakery type places on the station concourse the afternoon bash came into play which would be solely on HZ 2044’s on the Varazdin line; there being no moves during the day at all out of Zagreb unless you do long distance down the line. The whole afternoon’s bash was done, unwittingly, involving stations that started with a Z! It went like this Zagreb – Zapresic – Zeinci – Zapresic – Zabok – Zagreb; 5 different 2044’s, some better than others, and all on short rakes, I think 5 being the maximum. None of the trains were wedged despite the fact that we stood in the aisles on some. Timekeeping was ok and our planned bash was executed without an issue. Unfortunately the sunny weather turned into a downpour partway through the afternoon but thankfully had passed over by the time 2044023 deposited us into Zagreb a little late at 1833. Of the 5 2044’s we’d had ‘023 was by far the best and driven better than all the others too. 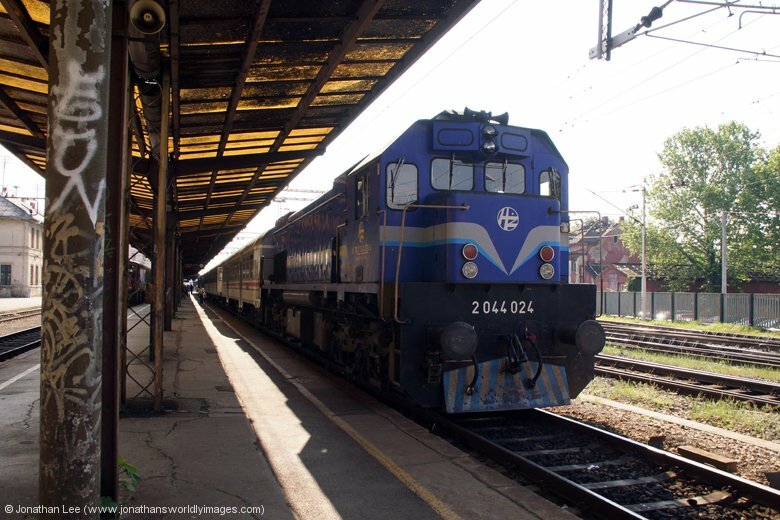 Having stepped back at Sesvete for the 1851 Zagreb – Slavonksi Brod we weren’t paying as much attention as we probably should have been when we stopped at Sesvetski Kraljevec; where we were supposed to be getting off. The station sign on the platform was partially missing and it hadn’t registered with either of us that the part remaining was the last part of said station where we should have been getting off. By the time we did realize the guard was giving the tip to the driver, from the door we were stood at, I made it off the train as it set off but by the time Aidy had got from the opposite side of the coach 1141388 had accelerated its 3 coach set to a speed which wasn’t one worth risking jumping off at. Apart from that the guard was in the doorway, which I’ll give him his due, trying to get the attention of the driver to stop the train but he obviously wasn’t looking in his wing mirrors at the time; so off Aidy went into the distance, leaving me at a deserted Sesvete Kraljevec, with half a station sign! Obviously a few text messages were exchanged in an attempt to figure out where to meet up as the train Aidy was disappearing into the distance on was a minus 4 onto the train I was waiting for at Dugo Selo. However the text messages were needless as the minus 4 made, not that Aidy actually realised until 1141308 rolled in at Dugo Selo. I was pretty confident he’d made it as well with not being able to see the train in the distance at departure time; the line being straight for miles. 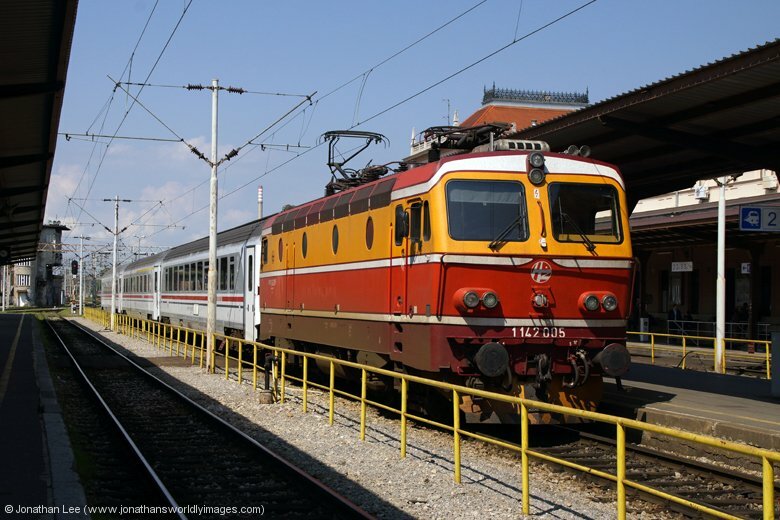 For a whole 20 minutes I’d lost Aidy but as 1141308 rolled into the station with only half a sign he was found again…..
As 1141308’s train, 2020 1452 Vinkovci – Zagreb, was about 10 late we couldn’t risk making Zagreb for 2107 1948 Zagreb – Novska so bailed out of a short fester at Maksimir; where we were greeted with 1141309 for the run out to Dugo Selo. At Dugo Selo we were dealt a bonus as the last train of the day rolled in with 1142012/006, both with pan’s up. 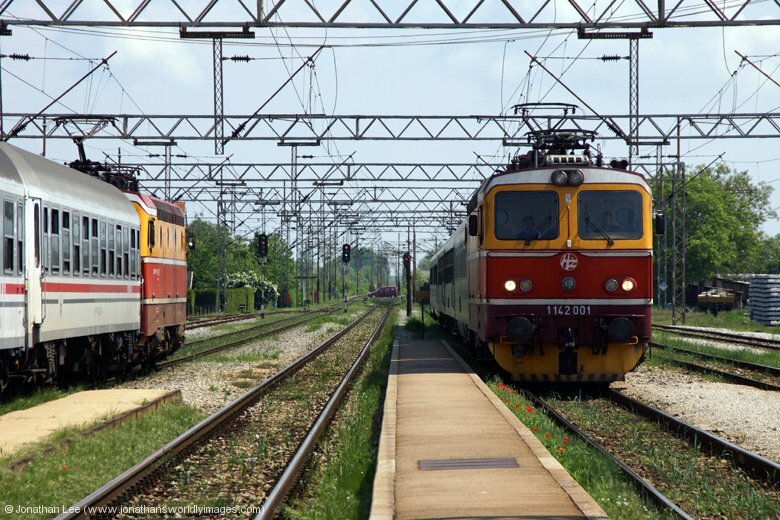 The train was two trains in one B782 1620 Osijek – Zagreb & IC204 1445 Budapest Keleti – Zagreb; neither of us had realised it would be a pair until they arrived and they topped off a very good day indeed. There weren’t any options for food nearby the station when we got back into Zagreb, other than bars so we ended up walking towards the city centre, past the Best Western and eventually came across the Gostionica Purger which had English speaking staff and served up some decent grub; all topped off by a Tomislav beer! Not a massively early start, leaving us plenty of time to sample, or should I say abuse, breakfast at the Best Western Astoria! The selection and variety of choice was by far the best I’d ever come across at a hotel breakfast. The food quality was good and the fact that it was plentiful hid the fact that we made up enough sandwiches for lunch later in the day, as well as the fruit that we also took the opportunity to take with us. We certainly weren’t in need of anything else to eat as we checked out at 0715. 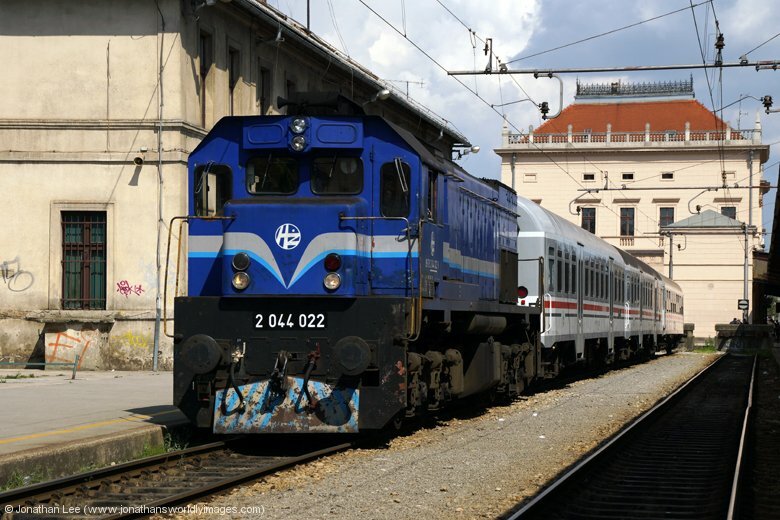 With the loco-hauled trains being a little slim on the ground on a Saturday morning in Zagreb we only had one option and thanks to the hotel WiFi and HZ Mapper we already knew that the engine coming back in from Sesvete would be new. 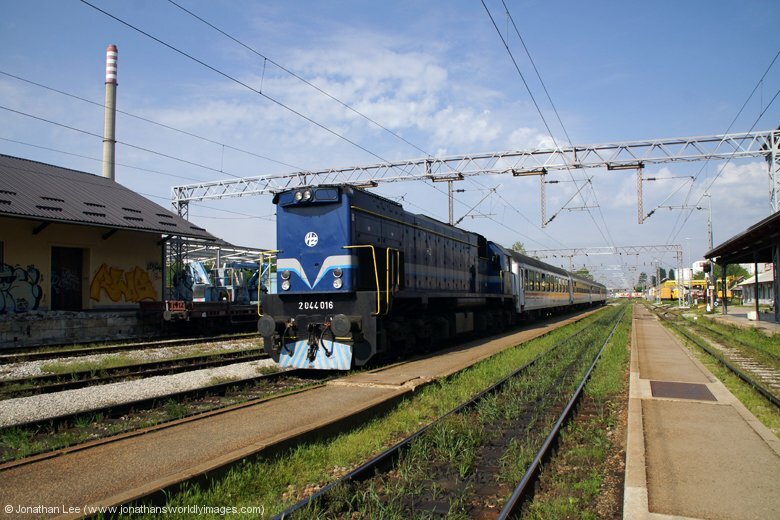 Luckily a new 1141386 was sat waiting with 2011 0745 Zagreb – Vinkovci, which we did out to Sesvete, where 1141305 promptly produced as HZ Mapper said it would, with 2010 0613 Novska – Zagreb. 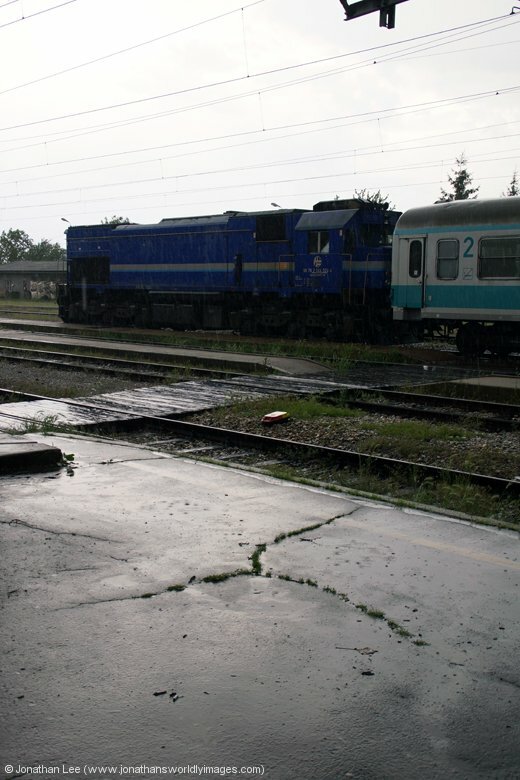 The Saturday morning weather was nothing like the previous day’s excellent sunny climate, instead it had given way to a dull start and rain; as a result we didn’t venture anywhere that meant getting wet during our 90 minute fester for our train across the border into Hungary. There wasn’t a great deal going off at the station during that time either, other than some shunting in the yard and 1141302 departing with 397 0918 Zagreb – Sarajevo. What neither of us had realised until it was literally seconds too late was that two coaches off EN1199 (Normally EN499) had been shunted off and were sat just over the points at the mid part of platform 2. 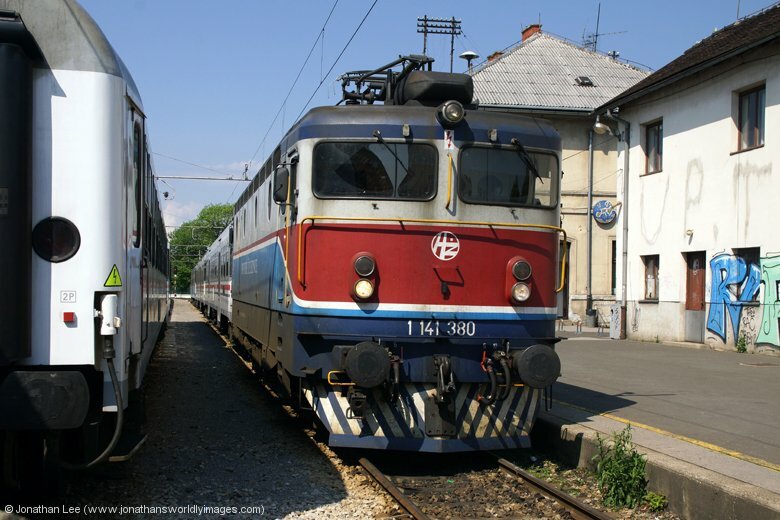 These were poised to be shunted onto the rear of B703 0540 Rijeka – Osijek when it arrived, to then form the stock for IC201 1002 Zagreb – Budapest Deli, which would run to Koprivnica with B703. When we realised that there was actually a gronk attached to the two coaches yonder side of the points we braved the pouring rain and briskly walked down the platform to try and get on the stock. We were about 5m away when the shunter gave the tip and the coaches started moving and as there was a second shunter stood in the doorway we couldn’t even get on while they were moving; so all that resulted from our walk down the platform was we got wet and then had to watch 2132324 overtake us as we trudged back through the rain towards the station canopy! Some people were still sat on the stock as it rolled by, having obviously arrived on it from Slovenia or Austria; so a perfectly valid gronk move passed us by……..
We joined said stock once it had been coupled up, which wasn’t very full at all as 1141389 departed Zagreb with the two trains coupled. 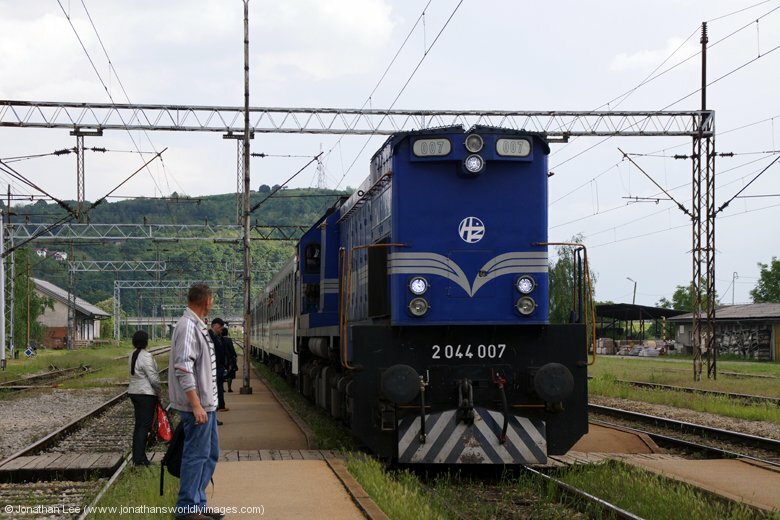 At Koprivnica the Osijek portion was detached, unfortunately we couldn’t see what the 2044 was that worked forward due to stock being in the way. 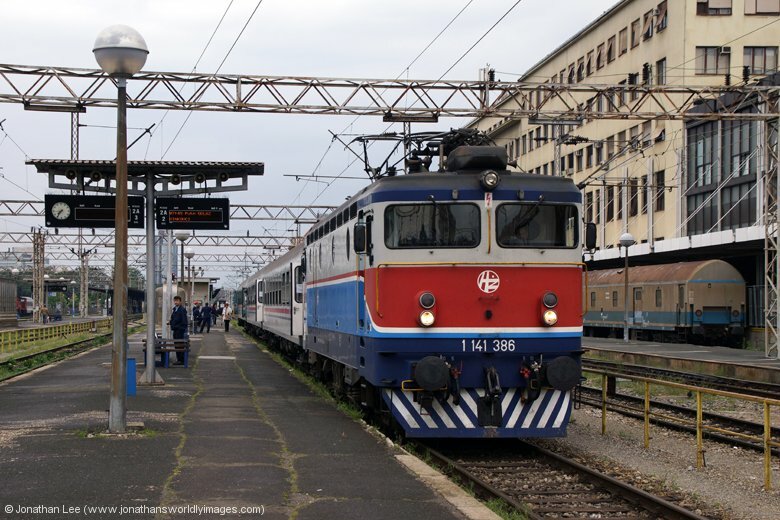 1141389 then worked IC201 forward to Gyekenyes in Hungary. 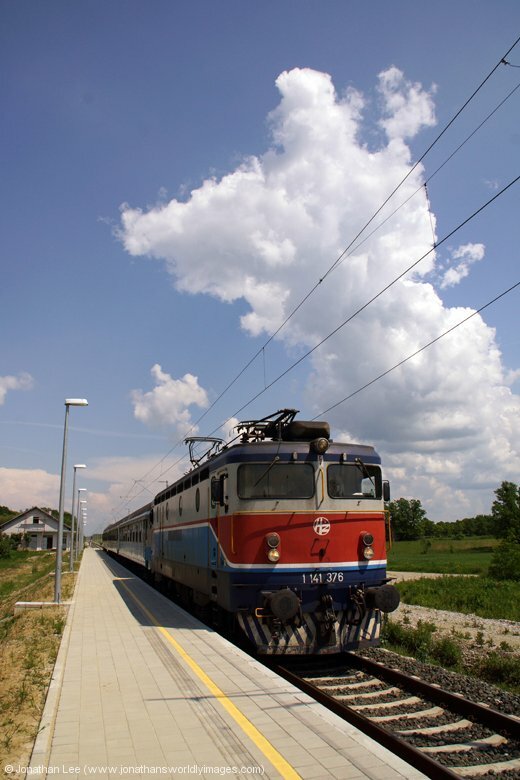 Between Koprivnica, Croatia & Gyekenyes, Hungary a Croatian customs officer travels with the train to check passports. Upon arrival in Gyekenyes Hungarian customs board the train in numbers and we weren’t allowed off until they’d checked our passports. They started from the rear of the train and as we were in the front coach it took about 5 minutes from arrival to us being on the platform; the train not being full at all. My suggestion would be to walk to the back on arrival if you’re doing any form of tight plus at Gyekenyes.